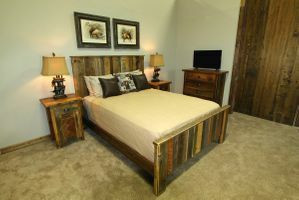 Using myriad different widths, colors, and shades of barnwood, this Glacier Park Builders Great Northern Vertical Plank Bed exhibits the absolute beauty of refurbished barnwood. A fabulous bed, this one is so wonderfully rustic and lovely, you will want more of this Great Northern furniture. This bed is available in Twin, XLTwin, Full, Queen, King, and CalKing sizes. Price shown is for Twin and XLTwin only. See drop-down window for prices on other sizes. This piece of Glacier Park Builders furniture is formed from reclaimed barnwood and completed with a high-quality finish.